Ken Schram Photography: How Large is Your Lightroom Catalog? How Large is Your Lightroom Catalog? As a technology professional I employ all of the best practices to keep things running smoothly and efficiently, but inevitably things just start to bloat and slow down over time. I’ve been running it pretty hard for just about 2 years now and this is generally the point at which I’d wipe the hard drive clean and reload my favorite applications and data from scratch. A fresh start. If you’re a reader of the blog, you know I’ve been keeping my eye on the Microsoft Surface Pro as a potential laptop replacement. Unfortunately we’re still a few months away from the release of the product so here I am in “limp along” mode. Windows 8 has been available for a few weeks now too which, for a self-proclaimed geek, it’s pretty hard to sit back and wait patiently rather than just pull the plug and rebuild my current machine. Still, I wait. One of the areas I’m noticing the most degradation is within Lightroom. I have only a single catalog which is now approaching 9,000 images. I’ve read posts online from people having 5 or 6 times that number in their catalogs seemingly without performance problems. Regardless, I’m wondering if it’s time to start with a new catalog when the eventual migration to the Surface Pro happens. After all I will be taking a step down from 500GB of storage in my current laptop to just 128GB (plus whatever memory card I purchase). So what does 9,000 images translate to in occupied storage space? How many images reside in “My Favorites” collection? 65. I have just 65 photos out of nearly 9,000 images that I feel are “portfolio quality”. I guess that helps me make my decision. I think with the advent of a new machine I’ll be bringing over those favorites into a new catalog and archiving the rest to external storage. Another “fresh start”. How about you? 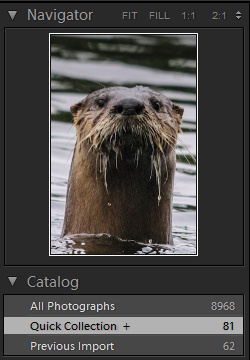 How many images are in your Lightroom catalog and have you noticed any loss of performance as your catalog increases?